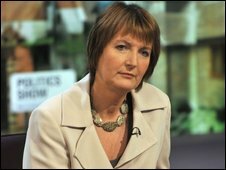 The British National Party could pose a major threat to Labour in the upcoming European elections, Labour's deputy leader Harriet Harman has said. The BNP "are a bigger threat than they have been before", she told the Independent newspaper in an interview. She also outlined Labour's efforts to counter the BNP ahead of elections for the European Parliament in June. Labour is "focused on the BNP in this election in a way it hasn't been previously," she added. Labour is using the slogan "fairness not fear" in areas where there is heavy BNP activity, instead of its national banner "winning the fight for Britain's future". It is also working with anti-fascist groups and using anti-BNP "battlebuses". Ms Harman, who is also leader of the Commons and Labour's chairman, was speaking after a campaign visit to north-west England, where BNP leader Nick Griffin is a candidate. "Most people are not aware the BNP is standing," she said. "It is below the radar. There is very low public awareness of these elections. "For us, it is a question of pointing out the dangers of the BNP, which now wears suits but whose ideology is as pernicious as ever."